Can you believe it? 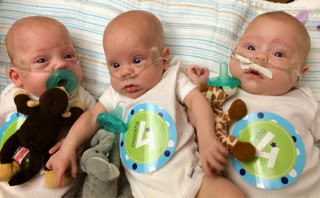 The Mann Triplets are 4 months old already!! 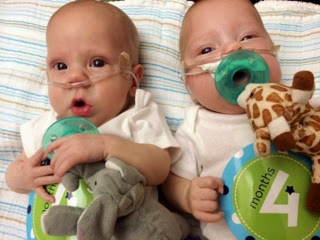 Actually they turned 4 months old last Friday. 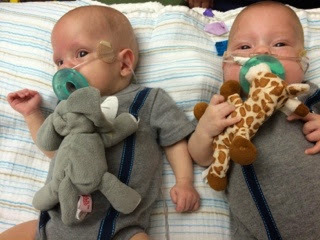 I just made it to the hospital for their monthly photo tonight because we’ve been so busy. Once again Mason did not want to cooperate in picture day. We had to work really hard to get the few good pictures we got! But it’s so worth it! Outfit #2 was more successful. The best ones are up top. We had lots of out takes too though. And lots of crying (mostly Brian). But overall successful considering I’m not a photographer and I’m trying to take pics of 3 newborns with my iPhone before Brian kills me. 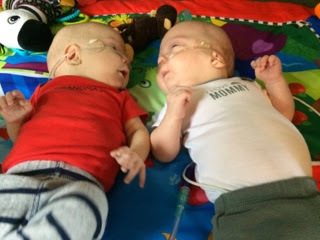 Note: I will get professional pictures done once the babies are all home if I can find a reasonably priced photographer with a lot of patience! 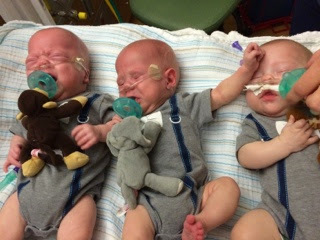 I actually signed up to get free NICU photos through the Tiny Footprints Project but they haven’t been able to find a photographer in Little Rock. (I know it’s crazy to do James first but he earned it!) 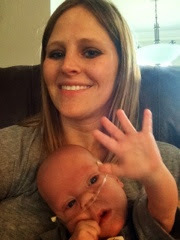 James is still in NICU but he’s doing so much better! He just finished a 9 day steroid for his lungs which has helped tremendously! 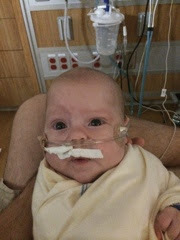 He’s now on 1/2 liter oxygen like his brothers. And he hasn’t had any issues. Yay James! He did have a hard time with the steroid though and kept dropping his heart rate. So they moved him back to a pod (out of a private room) so he can be monitored more closely. He hasn’t had any episodes since he’s been off the steroid. And we got him moved to pod 9, which is the best pod. 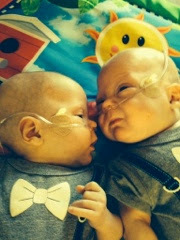 And our friends from East (the NICU room where they keep the tiny babies and where we started) are in pod 9 too! 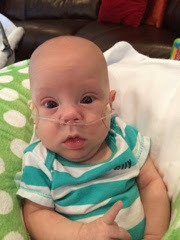 We have been working to get James’s reflux under control lately (as I’m sure you probably remember) so we’ve been trying to find the right formula for him. First we tried pregestimil. That helped but made James poop like every hour. So now he’s on nutramagen, which is the nastiest smelling formula. But it’s working so far so I’ll take it. They’ve also taken James completely off breast milk. I’m not too happy about this. But I am ok with it. 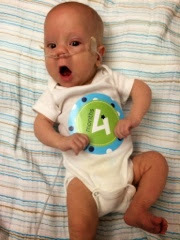 He got 4 months of breast milk which is more than I ever anticipated. Big news for James this week. He got his first bottle! He did great! 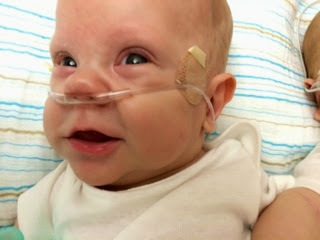 They started him at 10 ml once a day and now he’s up to 20 ml once a day. 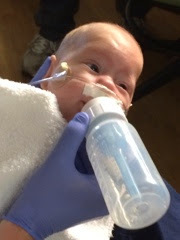 Hopefully he’ll get on the oral feeding pathway soon! James weighs 8 lbs. 3 oz. now. And he’s in size 1 diapers! 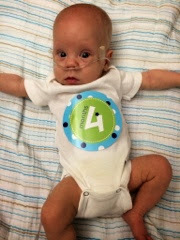 James can roll over from front to back AND back to front now! And he’s starting to smile, especially for Brian. Brian swears James likes his singing. I guess James doesn’t know any better! 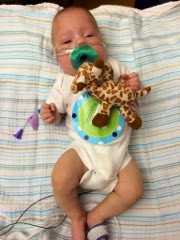 James’s favorite things right now are his swing, books, his mobile (especially the lion), and his giraffe wubbanub. 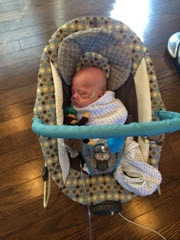 Mason is doing great at home! He’s our angry fussy baby. But we’re figuring out what he likes so that’s helping! 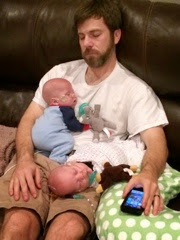 Mason sleeps pretty well IF we can get him to sleep. Sometimes he’ll even sleep for 5-6 hours at a time! Although he is pretty fussy, I’ve discovered that he’s calmer if he’s swaddled, even during the day, so I think maybe he’s just overstimulated. 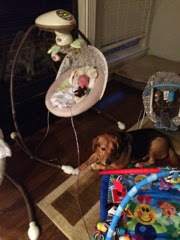 Mason’s favorite things right now are his bouncy seat with the hoot owls as our nanny calls them, being held (all the time! 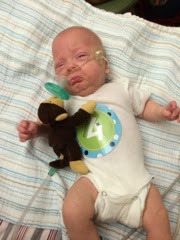 ), and being swaddled, and his wubbanub (Mr. Monkey). 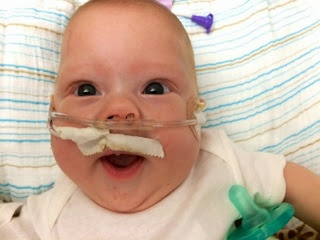 Mason has started rolling over (belly to back) and smiling (not very often). I can tell he’s beginning to be more alert and he loves looking around! I wasn’t kidding when I said he didn’t like pictures! Last but not least (except in size! 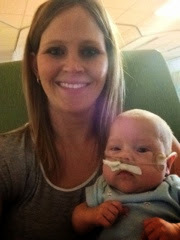 ), Logan is doing great too! He’s a pretty happy baby for the most part. I think I can see the biggest progress with Logan. He’s starting to really check out everything around him. He loves to look around! And he’s pretty social too. 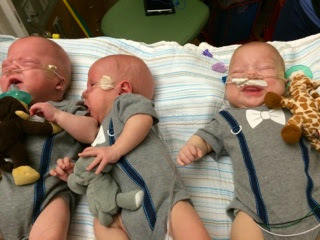 He seems to really enjoy being with his brothers! 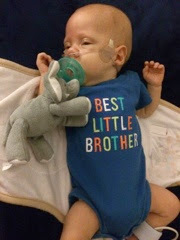 Logan is starting to get stronger finally. He has rolled over front to back but I think it was an accident. He’s definitely making progress though! And he’s started smiling too! And it’s the sweetest smile ever! Brian caught a partial smile! James’s selfie. He started the trend! 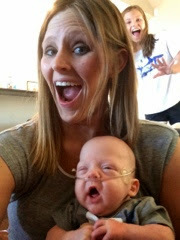 Logan says stop taking selfies Mom! Sorry I took so long to post this week! I’ll try to post sooner next time! 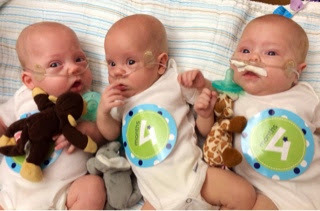 This entry was posted in Family, NICU, Triplet Milestones by Angela Mann. Bookmark the permalink.